Blue Springs and Eastern Jackson County is blessed to have many generous philanthropists. Truman Heartland Community Foundation is just one of the organizations that works to connect philanthropists with non-profit organizations. Following are the guidelines that an area non-profit would follow to apply for grants with the Truman Heartland Community Foundation. It is the mission of the Truman Heartland Community Foundation to improve area communities by promoting private giving for public good. Since its beginning in 1982, Truman Heartland Community Foundation (THCF) has taken a needs-based approach to philanthropy. Conducting annual needs assessments in the communities it serves, THCF has become an expert in listening and responding to community needs by providing creative charitable solutions and resources. From its community-wide assessments THCF has prioritized funding to address the many community needs; funding priorities are detailed in these grant guidelines. Today, THCF manages more than $35 million in assets, comprised of over 550 charitable funds established by individuals, charities, businesses and municipalities. THCF’s family of charitable fundholders make annual grants totaling more than $3 Million to benefit the local, national and global community! It is the generosity and commitment of THCF charitable fund advisors that enables the foundation to respond to community needs. THCF has established affiliate foundations in Blue Springs, Grain Valley, Lee’s Summit and Raytown and supports three foundation initiatives: THCF Charitable Reinvestment Foundation, Jackson County Free Health Clinic and THCF Youth Advisory Council. Nonprofit Business Solutions, a supporting organization, joined THCF in December of 2005. While THCF charitable fund advisors award grants year-round at their discretion, THCF awards grants from its unrestricted funds during one annual session. At the donors’ requests, these grants are limited to the following guidelines. For many years, I have had the honor and privilege of playing cello in the Heritage Philharmonic, an Eastern Jackson County orchestra celebrating its 65th year. The orchestra brings excellent music to our community, and provides opportunities for our best community musicians to share their talent and love of music. At 7:30 p.m. Saturday, the Philharmonic welcomes Conductor Laureate Jack Ergo back to the podium at the Blue Springs High School Performing Arts Center. The concert will feature Brahms’s Academic Festival Overture, Hindemith’s “Five Pieces for String Orchestra” and Dvorak’s well-known Symphony No. 9, “From the New World,” one of the most popular in the modern repertoire. Tickets are available at the door. Prices are $10 for adults and $5 for students. It will be an excellent evening of musical entertainment! It is a short six weeks until the citizens of Blue Springs will again choose a person to represent them on the City Council. While it seems we are always in the midst of some political season, this one has come upon us quietly. Several friends have remarked how this election has not generated the controversy of some in the recent past. This will be the first election in five years in which I will not be serving as a councilperson or seeking office in Blue Springs. I miss the personal contact of the thousands of homes I visited and the thoughts and opinions of so many of you during my campaigns and my time in office. The candidate’s efforts will include a variety of methods to convey their message to the voters. Some will knock on doors; some will use direct mail or the telephone. The Internet is another method of campaigning, including Web sites and social networking sites such as Facebook. It is important that we, the voters, make wise selections on who will help govern our city. Candidates focus on those that vote regularly. While the election board does not indicate whom you voted for, it does keep records of how often you vote. This information is readily available through the election board. I urge each of you to participate in the process of choosing your representatives, whether it is a local, state or national election. Take an active role in your community, and make an informed decision on Election Day. There a several opportunities in March to meet the candidates, learn about their ideas and visions for Blue Springs, and to ask questions. The Blue Springs Business Association will host a candidates forum at 8 a.m. March 11 at Clancy’s Bar & Grill. 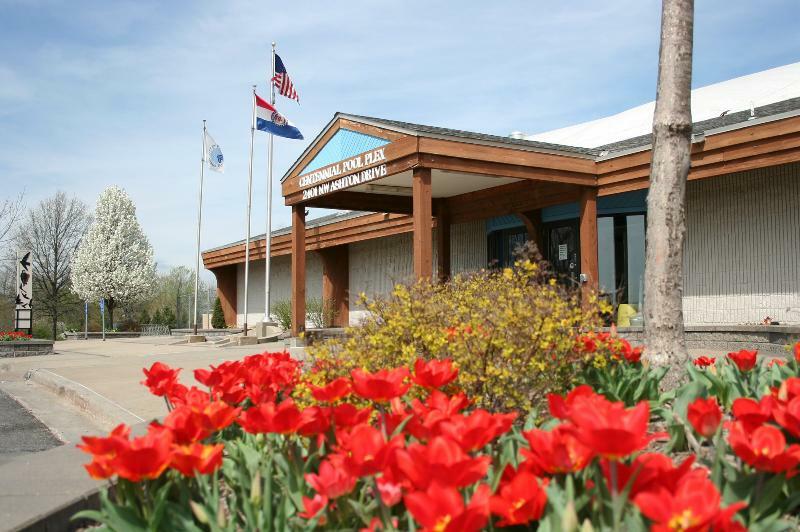 The Blue Springs Chamber of Commerce candidates forum luncheon is March 18 at Adams Pointe Conference Center. Reservations are required and can be made through the chamber office. Watch The Examiner for other opportunities to meet the candidates prior to voting on April 6. The warmer weather in March will bring colorful flowers like these in front of the Centennial Swimming Pool. Spring is fast approaching and we hope that you will take advantage of the variety of programs, activities, services and facilities that we have for you, your family and friends. Check out what we have to offer this month. My Church, Timothy Lutheran is having a volunteer day on Sat. the 27th at different locations, I was put in charge of Impact Ministries to help get their new location ready at White Oak Shopping Center, and out of our large church only 7 signed up to help on my team, ( I was warned that Lutherans don't like to Paint!!!??? ?, whoever heard of such a thing?) anyway Impact Ministires was told we would have 30 volunteers, (not by me). So if you or anyone you know would like to help the community and have some spare time Sat. the 27th from 9am to Noon, let me know. Looks like we will be painting etc., see below. As you will see below Timothy is serving A continental Breakfast before hand and lunch afterwards, this is optional but we would love to have you all join us, and I will be there. The volunteer time is about 3 hrs. Do not feel you have to do this, I just thought I would throw it out there, and you only need to contact me if you want to join in an feel free to pass it on. See all info below sent to me. I heard back from Kim at the Impact Ministry yesterday. She said we will be cleaning, preparing walls for painting and then painting if volunteers/time allows. She asked that we bring shop vacs, ladders/step ladders (to clean up high on the walls). I spoke with our Serve Team and we would like to limit the number of volunteers that have to supply these items. I know Steve Jorgensen, myself and the Wands all have these items we will plan on supplying for use. If you have these also that would be good to bring and then if we need to ask a couple of volunteers we can do that...but we want to make it as easy as possible on them to participate...do you agree? She said to also encourage people to bring water bottles if they'd like, and you can bring a radio for music too (for some good sound). The other thing she mentioned is if we know of anyone that knows how to operate a paint sprayer...if so, they would rent one for the volunteer to use...so if we find someone we're supposed to let her know. She will also supply other paint supplies (brushes, rollers, etc). She clarified that the location is right next door to Big Lots off 7 Hwy. She said they have big glass doors, no sign. The headline on the front page of Saturday’s Examiner, “Innovation Park hits roadblock,” was discouraging to me considering the hard work and dedication so many people have invested in making this project a reality. As I went on to read the article, my hopeful expectations for the future of the Innovation Park were restored. Rarely do complex projects advance exactly as originally envisioned. Adams Dairy Parkway itself is an example of the need and benefit of adaptability in accomplishing objectives for the greater good of the community. Today, we know that the University of Missouri component of the park will initially locate in the Heartland Financial building, adjacent to Adams Pointe Golf Course, while waiting for economic conditions to improve before beginning construction of the Mizzou Center. This is an excellent example of adapting and recognizing that market conditions require flexibility to accomplish this very worthy goal for our community. The vision of Missouri Innovation Park is to build a regional home for a knowledge-based workforce dedicated to innovation and the commercialization of the ideas that come from that work. The park will link scientific research, higher education and entrepreneurial development and as a result encourage high-tech commercial development along the Adams Dairy Parkway corridor. The current plan is to locate the first building in the park immediately south of the Adams Dairy Landing shopping center. Future expansion will initially be to the south. A recent economic impact study found that over the next 15 to 25 years the Missouri Innovation Park would bring close to 3,765 new jobs within the park itself and indirectly an additional 2,140 jobs in the surrounding community. The average pay for these jobs would be $51,000 per year and in many situations, higher incomes are likely. Proposed state legislation to encourage and accelerate the development of the park – House Bill 1635 and Senate Bill 922 titled “Missouri Jobs For the Future” – is the vehicle for accomplishing this objective. I would encourage us all to stand together in support of these bills as we work to continue the progress toward the Missouri Innovation Park’s development. Mary Goes Round is a Kansas City-based rock/alternative/pop cover band that moves you, shakes you and plays everything from Bowie to We the Kings! Not the same, tired songs, Mary Goes Round has a fresh mix of tunes that will keep you dancing and rocking all night long! The band will be playing the Blue Moon Lounge at Lunar Bowl Friday, Feb. 19th at 9 p.m.
On February 10, 2010, Jeanne Schmick spoke to the Blue Springs Rotary Club. Jeanne is a medical paramedic with LifeFlight air ambulance in Blue Springs. Jeanne has been an EMT for the past 20 years caring for the critically ill and injured. Jeanne was part of the Rotary Group Study Exchange team to Africa in 2009. Jeanne came to the Blue Springs Rotary Club this week with a request that she needs small stuffed animals to take on her medical trip to northern Haiti. Jeanne leaves Friday to assist with the victims of the January 12th, 2010 earthquake. She is going to work at a small hospital through the Center for the Rural Development of Milot (CRUDEM)Foundation. The hospital in Milot has 73 beds and after the earthquake is caring for about 1000 patients, many of which are in tents on the surrounding grounds. Jeanne gave a short presentation to Rotary about the medical conditions there and the amputations which need to be performed. The Blue Springs Rotary members are supporting Jeanne in her travels to Haiti by donating over $600 in cash and by sending 60+ stuffed animals and 80+ baby receiving blankets with her. To see a video about the hospital see http://vimeo.com/9236856 (viewer discretion is advised).